Look, the internet of things is hot right now. We even put out a connected gift guide that showcased a variety of connected products and home automation devices. But after spending the holiday testing a variety of connected devices and fielding questions from my friends and family about the internet of things I realized I was answering the same questions and saying the same things over and over again. So I figured I’d condense it down into a little list in hopes of helping others navigate the smart home and the internet of things. You can buy one for yourself, but the home hubs such as SmartThings, Staples Connect, Lowe’s Iris and Revolv all require a little too much hand-holding work for you to offer this as a gift to someone who hasn’t specifically asked for it. Best case, they’ll love it and you’ll be their technical support guy for the next decade; worst case, they’ll stare at you in utter confusion and frustration when you explain that in order for this hub to be useful they need to shell out some serious cash for connected lightbulbs, locks, outlets, switches and thermostats. Connected devices can offer convenience and a whiz-bang WOW factor that gets people excited. But if you want to add connectivity to your home, do it with a device that you know you want. People don’t buy systems, they buy something they need. So if you want to save money on your energy bill, get a connected thermostat. If you want to turn your lamp on when you’re out of town, buy a connected switch (if you want more flexibility, buy an outlet). If you want connected lights that change color, then buy the Hue lights. My living room after the Cardinals scored a run during the World Series. 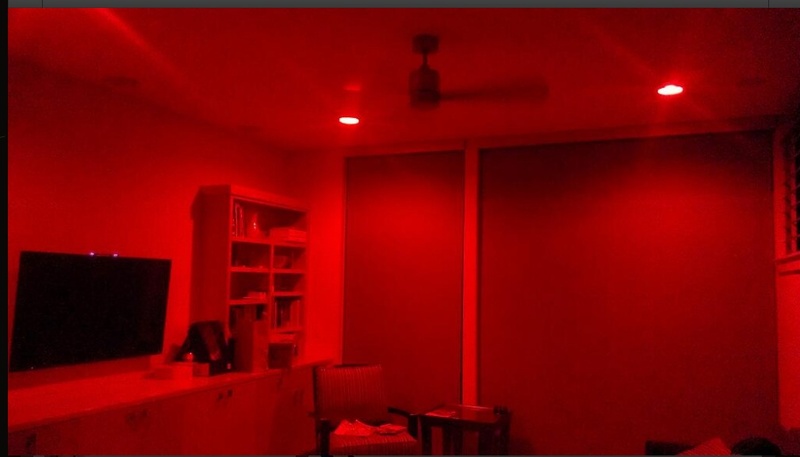 The Hue lights turned red. There are a lot of protocols out there in the connected home, but if you are going to start adding devices, stick with Wi-Fi. You won’t need a hub that speaks other protocols and you won’t have to get involved with the madness of Insteon, Lutron, ZigBee or Z-wave. You can just pop the device on the network and get started. Later, you or the gift recipient can get fancy with hubs and new protocols, but start simple. And if you can, buy devices that are open — meaning they let others (like IFTTT or app developers) access their API or let you control the device from other apps. This way, the device can evolve with your smart home or connected vision. As the market for connected products grows, companies trying to integrate those devices into a single app are working overtime to support the ecosystem. So a service like IFTTT or SmartThings will build channels and support for the most in-demand product or eventually a big-name brand will pay them to provide support for their products. I’m currently waiting on support for my Ecobee thermostat, which is coming, but has moved behind the Nest thermostat and might move even further back if someone like Honeywell decides to pay to get support. A perfect example of this might be the Hue lights. They are connected, but the color-changing aspect is what sells them. I could set up one in my daughter’s room and turn the lights to pink when I’d like her to come downstairs. I could set it to turn off at her bedtime. Add to this that you can connect it to web services to make it even more useful by putting a certain trigger to a certain color. Another example is the Lutron light switch I installed in our dining room. There the connectivity wasn’t as important as having a dimmer switch, but I’m already thinking of how I can use it. Maybe I’ll use it to freak out my daughter’s friends during a slumber party séance. Do kids still bust out the Ouija board during sleepovers? Those are the big elements to consider. Other basics are making sure you have the right device to work with your new connected gear. Most devices start out with Apple support and gradually add Android. So if you’re toting an old Droid you might be out of luck. I’m curious what others might add to this list. I’m sure in a few weeks I’ll have a few more testing scars and pieces of advice. Great tips. Any idea why device manufacturers usually offer support for Apple devices first, and then Android? Does this have something to due with their relative popularity, or ease of integration? My gift suggestion would be wireless lighting controls. in my opinion, this is usually what gets people on the path toward the automated home. You are also not locking people into a monthly service contract. I just installed Dropcam to keep an eye on things when I’m away. Easy setup, works well. Buy things that are IPv6 capable. Especially for devices where external (from outside your home *to* the device) connectivity is important, the increasingly mangled way that ISPs will need to deliver IPv4 service (via multiple layers of NAT) is likely to create additional headaches when one wants to actually connect to said connected devices. IPv6 bypasses all of this nonsense. Given that the US now has >5% active IPv6 users, “IPv6 isn’t available yet” is starting to be an invalid excuse. I’m with you, but even I don’t always know short of asking the company directly if a device is IPv6 compatible. That’s a high bar to clear for folks trying this out. Agreed. It would be nice if that info was easier to find, even if the answer is no, so that you at least know for sure one way or the other. I’ve complained to several folks in the Consumer Electronics space that it’s not always easy to determine whether their device supports IPv6 but that info just has not been published, or whether the information was purposely not there because the device doesn’t support IPv6 (and/or they don’t even know what IPv6 *IS*). For example, Sony confirmed via their official Twitter account that they have several BluRay players and TVs that support IPv6, but that info is nowhere to be found on their site. Part of me thinks that the only way to get that information to the level that it’s considered important to be published as a part of the specs is for them to get tired of answering the question via other channels.